COBA/Select Sires, Inc. is a farmer owned and directed Cooperative that provides superior dairy and beef genetics, reproductive products and services to benefit its member-owner-­customers. The cooperative serves producers in seven states in addition to the country of Mexico. COBA/Select Sires employs over ninety sales and service professionals. COBA is a founding member-owner of the federated Cooperative: Select Sires Inc., Plain City, Ohio. Download the requirements here or click here for the application. We are continually seeking highly qualified professionals to join our team. 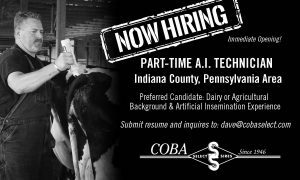 If you are interested in an exciting career with COBA/Select Sires Inc., please submit your resume and cover letter to coba@cobaselect.com.